I recently attended a Children Desiring God conference. CDG has a very robust strategy for ensuring that parents and churches raise the next generation to be Biblically literate and theologically accurate. One of the things they noted was that children need to be taught why they can trust the Bible. If the Bible is to be our guide book in life, we need to know that it is completely trustworthy. If it is to be the basis for our life, it is reasonable to want to know that it is 100% reliable. We want our kids to know both of these, so that they have no reason to doubt, or even reject, the Bible as they grow up. Here is an activity to illustrate the importance of having a reliable guidebook in life. 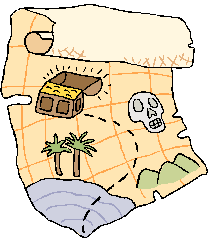 First, create two treasure maps. Have one map lead to some garbage and the other lead to a nice treasure (some coins, chocolate money or something else your children will like). Give your children the map that leads to garbage first. Tell them that the map leads to treasure. When they find the garbage at the end of the hunt, ask them if the treasure was worthwhile or not. The answer, of course, will be no. Tell your kids that they were basing their treasure hunt on the wrong map. This can happen in life as well. We all base our decisions and actions on something. The problem is, there is only one correct map for our lives. Only one leads to real treasure in the end. That map is the Bible. If we follow any other map, we will end up with garbage at the end of our life. Give them the real map and tell them that this map is like the Bible. Just like the Bible is 100% trustworthy to guide us to treasure, so is this map. Now let them find the real treasure. Filed under Apologetics for Kids, Can We Trust The Bible and its Authors? ← Who Got to Pick What Went in to the Bible? Thank you so much for the wisdom you are imparting on this blog. I only recently discovered it through Natasha Crain’s amazing blog. The lessons we are learning on your blog are very helpful for our kids as well as for us the parents. We tried the treasure hunting activities yesterday with kids .It was so much fun and it drove home the message that the Bible is the only right map to guide us to real treasure . Other map(s) will lead us to garbage at the end of our lives. Thanks so much for your feedback. It’s always so neat to hear from someone who has tried something we did. Please also feel free to change the activities to suit your needs – and if you can let me know what you did so I can share it with others! God bless you a well.